Largely because of the economic realities of Twitter clients, few developers ever invested in a Twitter app for iPad that wasn’t a cost-effective adaptation of its iPhone counterpart. Many took the easy route, scaling up their iPhone interfaces to fit a larger screen with no meaningful alteration to take advantage of new possibilities. In the process, Tweetbot 4 offers a dramatic overhaul of the iPad app, bringing a new vision for a Twitter client that’s unlike anything I’ve tried on the iPad before. The most notable change in Tweetbot 4 for iPad is a new column view that puts a second column on the right side of the screen in landscape mode. Based on Tapbots’ previous work on OS X, the second column allows you to pin views, lists, and searches for the current account to the right. The column is fully interactive and it lets you move across different sections at any time with one tap. This won’t come as a surprise, but Tweetbot 4 adds support for iOS 9’s Safari View Controller to open links inside the app with an in-app browser based on Safari. Safari View Controller can be enabled by going to Settings > Browser and toggling ‘Open in Tweetbot’. This is not a review. There are several other places you can go for that. What I want to talk about are the little charts it provides in the Stats view. They’re fun without being obsessive the way Twitter’s own analytics charts are. Recently Tweetbot 4 was released as a cross-platform update that’ll work on iPad & iPhone. Right now (at 50% off), it’s a $4.99/£3.99 app. Regardless of whether you bought the old Tweetbot recently, or at all. The other problem, not Tapbots’ fault, is that to get out of Safari View Controller, you have to scroll to the top and then reach to tap the Done button at the top right of the screen. The new Mac version (App Store) uses San Francisco, which looks great, and adds a useful Scroll to Last Read feature. There’s a bug with the global hotkey, which I’ve worked around with a script. There is still no way to select text in the main view. According to Paul, the next revision to Tweetbot will use monospaced numerals in the countdown, which will eliminate the jumpiness except when the number of digits changes. This’ll be much better, although personally I’d prefer either a right margin with a fixed width large enough to accommodate a three-digit count or to have the counter moved from the right margin to the otherwise unused space under the user’s avatar. 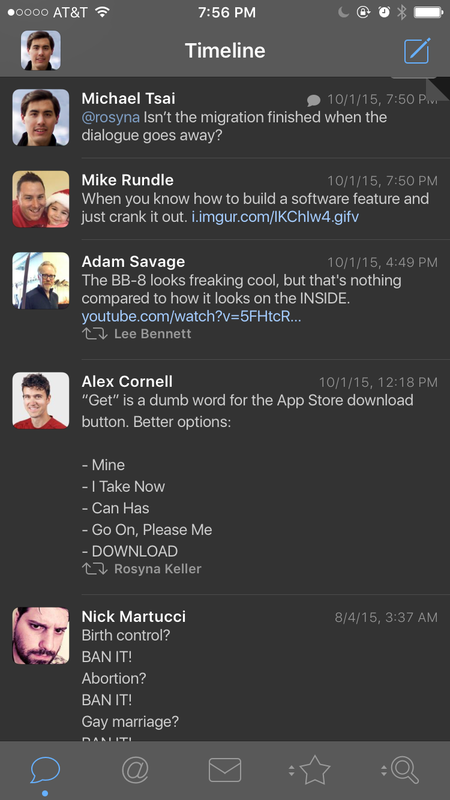 Update (2015-10-14): The Tweetbot 4.0.2 update adds a swipe gesture for closing the Safari View Controller. Unless I'm missing something, there seems to no longer be a very effortless way to quickly flip between Twitter Lists, which is how I browse timelines now. I practically never use the main timeline any more (too prolific, and is why I wish both Tweetbot and Twitterrific would allow the timeline icon to be changed to something else). I had switched from Twitterrific to Tweetbot some years back and loved it. I went back to Twitterrific a year or so ago when Tweetbot developed an issue that seemed to take a long time to resolve (yet I don't remember what it was), and the fact that the iPad version languished for so long. 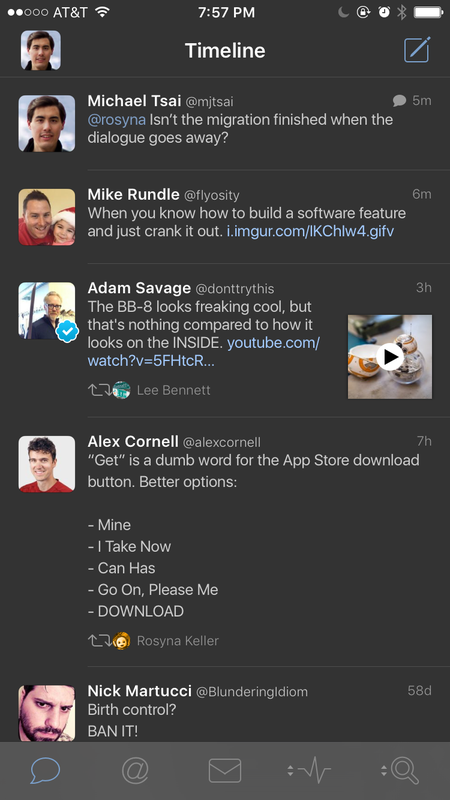 One big reason I'd want to go back to Tweetbot is for the ability to RT a tweet seen from one account to another. But I have it on good authority it's on the strongly-being-considered list of features for an upcoming update to Twitterrific. Changing lists is the same as before; just press and hold on the header (where it says "Timeline") to switch between lists.